Darryl Taylor can easily sum up his experience at Cranbrook with four words: Skill, Knowledge, Character, and Citizenship. The same words that are etched in stone in front of the school’s Academic Building. “Those four words guided my life and career,” he says. A “kid from the projects in Detroit,” Taylor arrived at Cranbrook in 1968, a student in the Horizons-Upward Bound program. After graduation, Taylor went on to get a degree in dentistry and then serve as a naval officer for 30 years. 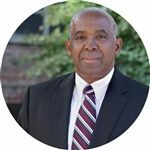 Today, he serves as the director of Cranbrook’s Horizons-Upward Bound program, the very same program that gave him his start all those years ago. After 30 years of military service and a current position that allows him to help close to 180 at-risk kids a year, his character is as well preserved as those words in front of the Academic Building.